A deep fryer is a food preparation workhorse and is an indispensable home appliance. Frying foods can be messy and tricky as you have to deal with hot oil. This is not at all fun since the sizzling oil tends to splatter onto you. If you love fried foods and want to make them often, it is time to look for a deep fryer. A deep fryer is a worthy addition to your kitchen if you enjoy fried foods and make them frequently. The stainless steel deep fryer from Excellsteel caters to all these requirements. Excellsteel includes several features to ensure the safety of the product. It has a stainless steel exterior which makes it strong and durable. The encapsulated based facilitates even and faster heat distribution that will be appreciated by enthusiastic cooks. The deep fryer has features that will make it easier to use. The set includes a 6-quart deep fryer, a frying basket, and stock pot. 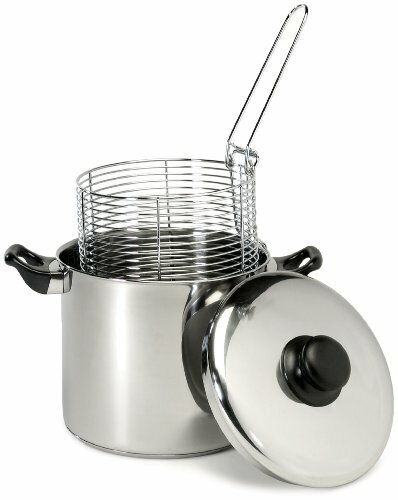 The wire frying basket transforms the pot into a deep fryer. Food can be removed conveniently with the help of the basket. It removes the excess oil and makes the fry light and crispy. The basket has large curved handles that make it easy to use. Here are some of the features of Excellsteel Stainless Steel Deep Fryer. The Excellsteel Stainless Steel Dee Fryer has certain features which can prove to be beneficial for homeowners or small commercial establishment. The Excellsteel Stainless Steel Deep Fryer is mainly used by homeowners. It has some excellent features which makes it a good choice for frying small quantity of food, such as four chicken drumsticks. Since it is a stove top model it can be installed in the kitchen conveniently. This can also be used by a small-size commercial establishment. The usability of the deep fryer is enhanced by encapsulated base. This helps in the even distribution of heat and heat up oil at a faster rate. It is made of stainless steel which ensures its durability. The fryer has a lid which makes it easy to cook the food. This lid can prevent oil from spilling and splashing. This will keep you from getting burnt and will also help in keeping your kitchen clean. The stainless steel exterior makes it easy to clean. It has been provided with a frying basket. However, the size of the fryer is too small when you have to fry food in large quantity. Moreover, the handle of the basket does not have a lock and thus, there is a risk of getting burnt while transferring the food item, if you do no take care. Another problem with the deep fryer is that the gaps in the basket are big enough to cause small items to slide out. Also, it takes a significant amount to time to reach a stabilized temperature. This is a great fryer for small meals and big snacks. This is a versatile tool which makes it easy to fry foods from the stove top itself. It can also be used for preparing pot roasts, soups, stews, and other foods that you like. By comparing Excellsteel Stainless Steel Deep Fryer to other variants that are available in the market will help you to understand how good it is. Two other deep fryers available in the market are Hamilton Beach Deep Fryer and Deep Fryer Set OD506 from Handy Helpers. The Deep Fryer Set from Handy Helpers is a good choice. This is a 3 piece non-stick deep fryer that helps you to prepare crispy and golden fry within no time. It is available at a pretty cheap price. The thin metal frame results in quick heating. However, this can be a drawback as the temperature might spike and cause food to burn. Within few days of usage, you will find the paint flaking off. Another good choice is the Deep Fryer from Hamilton. This has eight cup oil capacity. It has a lid which keeps oil from splattering. The feature of cool touch hands prevents accidental burns. The basket can be lifted even when the lids are closed. You can fry crispy mouthwatering food without getting the kitchen messy. It also allows you to adjust the heat. This deep fryer can be a good choice if you are ready to overlook certain drawbacks. For instance, it requires too much of oil and has smaller frying capacity. If you have a shortage of space in your kitchen, this might not be a good choice. The Excellsteel Stainless Steel Deep Fryer is not the best fryer that you will get in the market. Nonetheless, it is not the worst choice either. If you want a deep fryer within an affordable price, this is rather good. The deep fryer will heat oil faster and will reduce cooking time. However, care must be taken while transferring food from the fryer to the plate. Since it is made from stainless steel it makes it easier to clean. This is a durable and sturdy product which will prevent your kitchen from getting messy.